Style Manager for Excel allows to create advanced and professional style formats to application to Excel data and reports. The Style Manager add-in for Excel assists in the design of report styles and formatting that can be saved, organized and then quickly applied to new Excel reports. Since professionally created styles can be shared across workbooks, the Style Manager for Excel is ideal for applying corporate look and feel of Excel based data across organizations. Create unique Excel style collections quickly and easily for later use. View the library of style collections in a categorized tree view explorer window. Create and modify styles from colors, fonts, borders and patterns in any combination. Organize and manage catalogs of professional Excel styles quickly and easily. Use custom built styles in conjunction with the built in Excel styles and formatting options. Apply created styles in any Excel workbook and across networks within an organization. The Style Manager for Excel is displayed in left part of the screen when working with Excel workbooks. 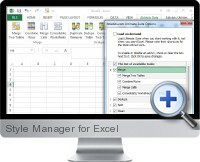 Style Manager for Excel is also available at a discounted price in the Excel Add-ins Collection Download.